This May, the Glass Art Society is hosting their annual conference on this special island, and the glass world could not be more excited. As the anticipation builds for this trip, I was reminded of my last visit to this glass Mecca in 2014, and the stories I encountered. As I anticipate a whole new batch of inspiring stories that are bound to get stirred up on this upcoming trip, I would like to introduce you to a few more of the interesting people and stories I encountered on my trip in 2014. I first met Davide Salvadore in the summer of 2003, when he came to teach for the first time at The Studio of The Corning Museum of Glass. 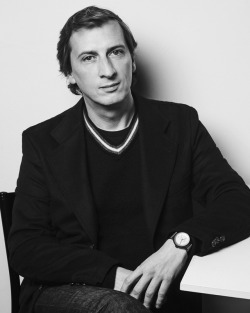 His artwork has gained international acclaim and continues to be well-documented. Davide is a wonderful storyteller. 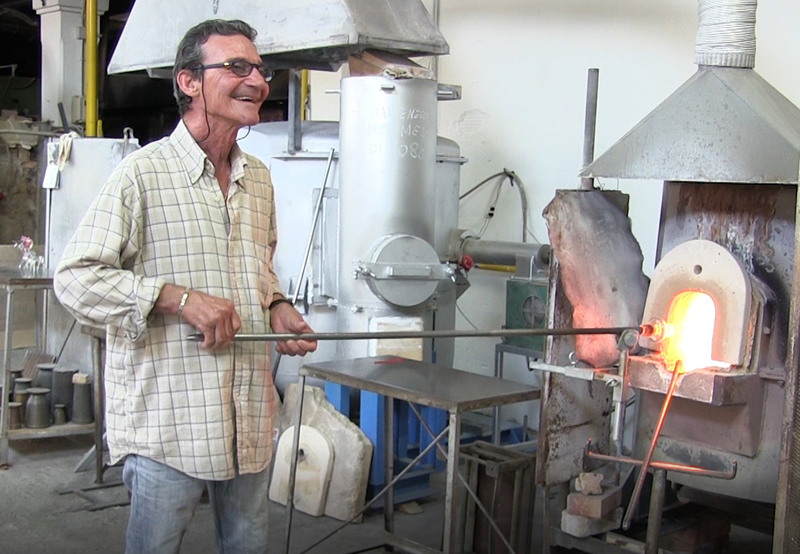 In the past, I had been fortunate enough to have him share some of his special stories of his early days in the glass culture of Murano with me, and I am thrilled that he was willing to share some of these on camera for all to learn from and enjoy. In this interview, Davide gives us his impressions on what it takes to truly master glassmaking. He tells the colorful story of the unique ways in which one of his early instructors taught him to work, and he discusses the real reasons true Muranese Maestros are so revered in their culture. It goes much deeper than most people think. a class at The Studio. I also had the opportunity to speak with Davide’s younger son, Marco, to gain some perspective on how the next generation of Muranese artists are growing and evolving. Marco and his older brother Mattia have had the benefit of learning from their world-renowned father. They continue to work as Davide’s assistants, as well as working on their own lines of glass artwork. In this interview, Marco tells us a bit about how he has learned and grown as a glassmaker. He also discusses some of the concerns of how to keep Murano’s glassmaking traditions alive in a very competitive glass world and a changing culture on the island. I had been hearing stories for years about a very unique maestro on Murano who was the king of making objects through a hot glass sculpting process the Muranese often refer to as “alla prima.” This refers to sculpting a piece of glass (typically an animal) quickly from a fresh gather directly out of the furnace before the glass has a chance to cool and without reheating it. 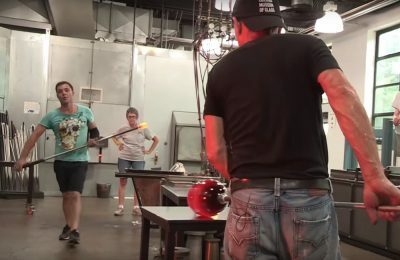 Many of us have seen the videos that pop up on social media of a glassworker quickly forming a horse from a fresh gather of molten glass. 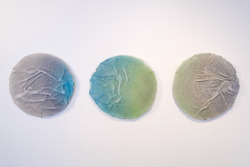 Moreno Bardella takes this process to entirely different levels. Reno, as he is known to his many friends, could fill an ark with the variety of animals he can sculpt in this fashion. Crafting these sorts of objects requires a great understanding of the material and the subject matter, as well as an incredibly accurate set of hands. Reno has worked for several different glass factories on Murano, and he does not have his own studio, so it can be difficult to find an opportunity to see him work. I really lucked out when he happened to walk into the Signoretto chandelier studio when I was there visiting. It was a holiday, and nobody was working in the shop. However, the furnaces were on, and Reno was willing to share some of his talents for the camera. Such is the serendipity of Murano when the cards are in your favor. Take a look as Reno treats us to an impromptu demo of a couple quick pieces. 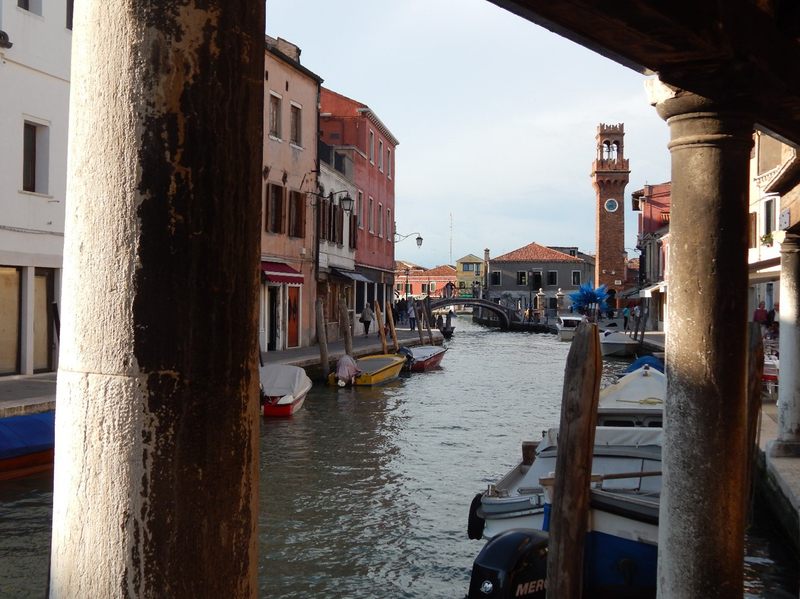 We will be publishing one more post about my Murano 2014 visit in May, just before the GAS Conference begins. 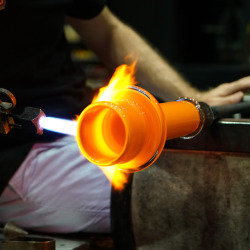 In the final post, we will cover my visit to the Fratelli Toso glass company, and I go inland to Vicenza, Italy, to speak with flameworking artist, Simone Crestani. this is a very well detailed piece on Murano island and its tradition. Thank you! Thanks so much Eric for your beautiful article on Murano Glass. in this time of speculation about originality craftsmen in Murano make more and more difficulty to survive. There are very few masters alive in Venice, and the young people is not ready to learn this art. Personally, at https://www.mademuranoglass.com , we take care to improve the production of Original Murano glass items.